WITH A FALTERING economy, soaring unemployment, and overseas military commitments consuming more each day than the gross domestic product of many small nations, the United States urgently needs adaptive and transformational leaders. In paying tribute to Harvard veterans at a Kennedy School Forum tonight, General David H. Petraeus will underline the importance of adaptive leaders in today's complex national security environment. Defense Secretary Robert Gates has called Petraeus the "preeminent soldier, scholar, and statesman" of his generation - roles that he transitions among as the commander of US Central Command. Is his leadership unique? And if so, in what way? In more than 100 hours of interviews with Petraeus, his mentors, peers, and subordinates, I have elicited numerous perspectives on his style of leadership and approach to juggling the responsibilities of "soldier, scholar, and statesman." 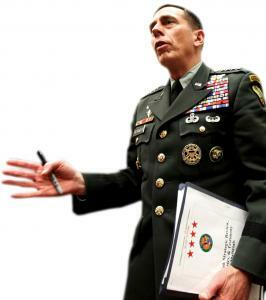 A common theme is that Petraeus models the very principles of adaptive leadership that he advocates. Adaptive leadership is a set of strategies and practices that can help organizations and the people in them break through gridlocks, accomplish change, and develop the adaptability to thrive in complex, competitive, and challenging environments. It differs from many leadership perspectives in its core premise that one can learn good leadership. Yet, in hierarchical institutions like the military, enabling creative decision making and encouraging young leaders to challenge assumptions can prove difficult. An organization's adaptability depends on having widespread leadership that can come from anywhere within. Petraeus recognizes this, as has become clear in my interviews. Through operations in Iraq, his influence at the Army's Training and Doctrine Command, and the military's new counterinsurgency doctrine, he has relentlessly promoted a "flatter" hierarchical structure that empowers subordinate leaders to think outside the box, take initiative, challenge assumptions, and even question authority. Hierarchy and respect for authority are obviously critical components of military bearing and unit cohesion. However, the current asymmetric threat environment increasingly requires unprecedented initiative, judgment, and creative thinking. In Petraeus's words, "we must continually think about the relatively junior officer who has to make a huge decision, often with life or death consequences, in the blink of an eye. There is no substitute for flexible, adaptable leaders. The key to all that we did in Iraq was leaders - especially young leaders - who repeatedly rose to the occasion and took on tasks for which they'd had little or no training." Whether dealing with friend or foe, adaptive leaders must also deploy nuanced interpersonal skills. Interestingly, Petraeus seems to take a thematic approach to influencing others, an explicit task in military leadership doctrine. Whether focused on generals or diplomats in Iraq, Afghanistan or Pakistan, or his "army of mentor-ees," Petraeus's enthusiasm for engaging with others helps build their ownership as stakeholders in outcomes. A positive cycle ensues: multiple stakeholders are empowered, and Petraeus gets a more robust strategic assessment of the complex challenges he must confront. Yet, because adaptive leadership can generate resistance, exercising leadership can be both difficult and dangerous. Still, Petraeus states that a critical leadership task is to be willing to take prudent, calculated risks to achieve the vision and meet the commander's intent. Petraeus offers what he feels is most important in adaptive leadership through simple but salient points. In his mind, the fundamental task of strategic leadership is getting the big ideas right and setting the appropriate tone and energy level. When dealing with the uncertainty of virulent insurgencies or economic downturns, it is critical that leaders manage expectations and be first with the truth. In other words, under-promise but over-deliver. The sheer quantity of issues and uncertain nature of our current threat environment requires innovative thinkers who can manage and lead adaptively. Petraeus advocates for leaders who learn and adapt, are willing to take risks, encourage initiative in others, and empower their subordinates to follow suit an argument well received from a "soldier, scholar and statesman." Paula D. Broadwell, a major in the US Army, is a pre-doctoral research associate at the Harvard Kennedy School's Center for Public Leadership.